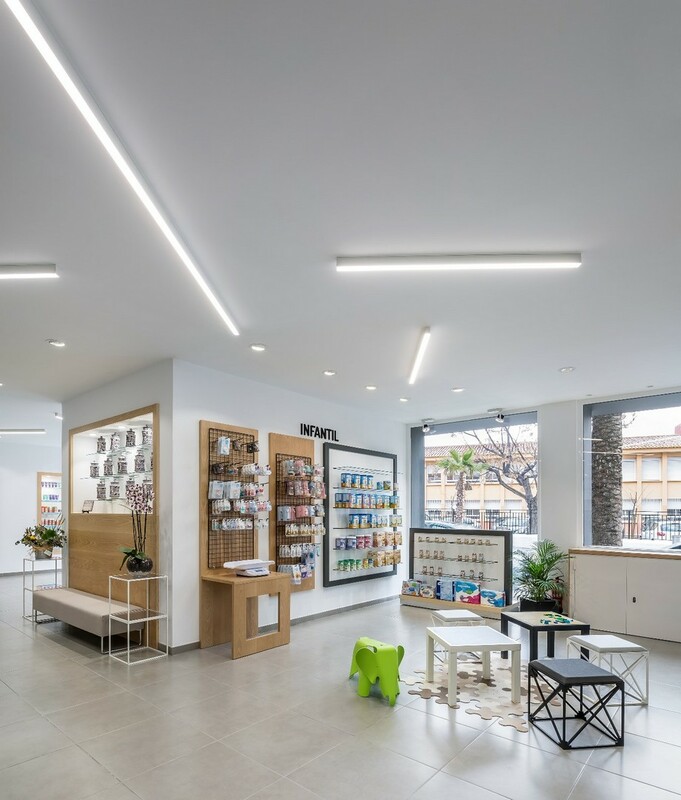 Farmacia Sud opened in 2016 on the ground floor of a renovated building in Valencia. Architects from Valencia’s d’Estudio devised and executed the interior. 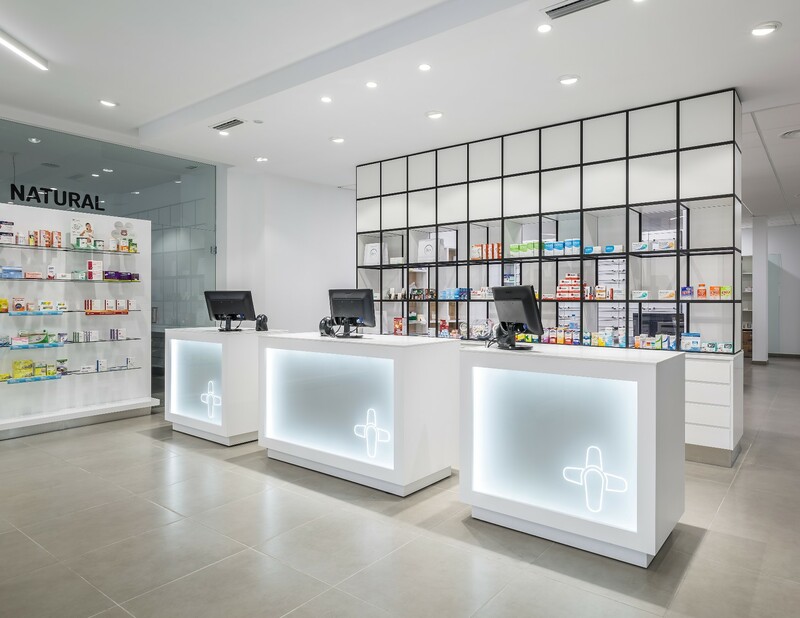 What characterises Farmacia Sud is an open floor plan that includes a private and undisturbed back office with easy access and a clear view of the pharmacy. The architects were challenged to organise the room in a way that ensured the best working environment. D’Estudio chose GRID, a modular interior system, to integrate the two areas seamlessly. The set-up includes a multi-functioning partition that can accommodate all requirements and amenities. 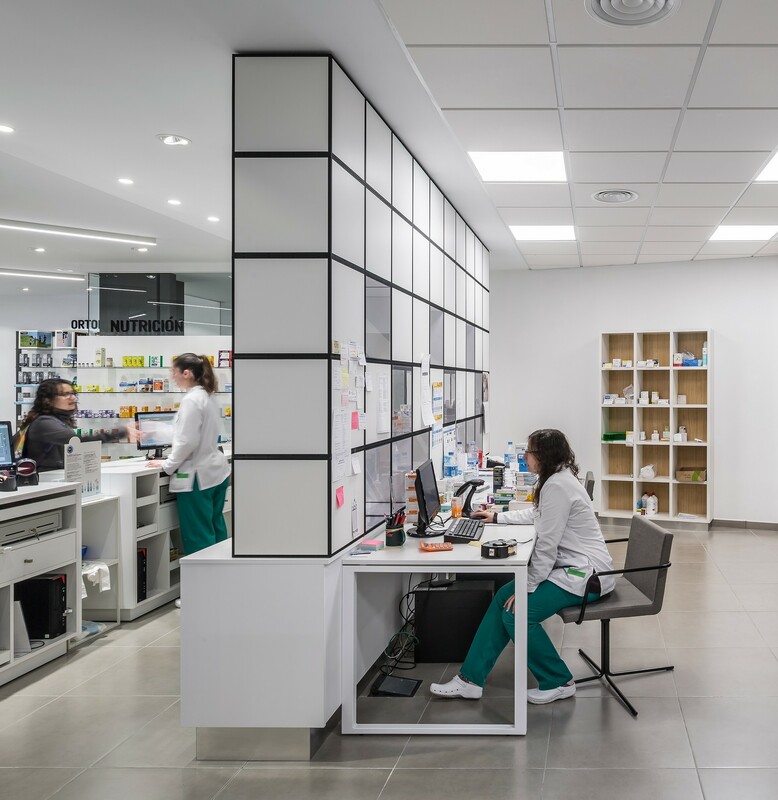 In close collaboration with GRID System ApS, d’Estudio used a partition with shelves for display, solid panels for privacy and transparent panels for a clear view and sound absorption. By merging great design and function, GRID exemplifies an exclusive and well-working architectural system. GRID’s flexibility made it possible for d’Estudio to create a ‘room within the room’ and customise the partition to utilise every square meter fully. Additionally, stools and side tables are used in the store area. The overall space is designed in a minimalist style with utility and aesthetics in mind. Partition │ Black GRID modules form the structure. As a contrast to the black lines, white and transparent panels fill the modules. Modules and panels provide a strong and elegant look when placed next to each other. The repeating structures also make the product display easy to organise. Upholstered Stools │ GRID modules, cross braces and upholstered seats were assembled into black and white stools and with fabric from Kvadrat. Side Tables │ Two side tables were created from white modules placed on top of one another with transparent shelves. These are used as decorative units. GRID is the ultimate flexible interior system, based around a 40 x 40 x 40 cm module in black or white. GRID can be used at offices, stores, museums, hotels, restaurants and other contract markets. Modules can easily be assembled in any desired width, height and depth, from two modules to hundreds. Assembled modules can be disassembled to create new configurations. These qualities make GRID a uniquely modular, durable and practical solution for any space. Once you have the basic module, you can add shelves, panels, seats, drawers, cupboards, whiteboards, plant boxes etc. to create a partition, desk, seating unit, display, exhibition wall, podium – even a multi-purpose unit. GRID’s mounting holes make the system versatile and user-friendly. Its design is minimalist with an industrial, yet elegant look. The infinitely repeated structures make GRID an architectural experience in itself, and the endless design possibilities give the user ownership of the final design. This story is also published on Architonic.